At the age of nineteen, George Rogers Clark had a land claim on Fish Creek in what is now West Virginia. In 1783 Thomas Jefferson asked Clark if he would lead an expedition to explore the western part of the continent. This endeavor was not undertaken, but Clark later would bring younger brother William to Jefferson’s attention. 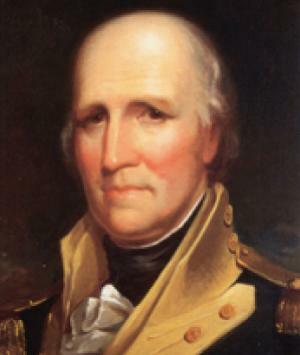 George Rogers Clark accepted a commission in the French Army in 1793 with the expectation that he would lead Kentuckians against the Spanish. President George Washington ordered Kentucky Governor Isaac Shelby to have Clark arrested. Shelby refused. In 1812 George Rogers Clark was awarded a $400 disability pension, as well as an honorary sword now on exhibit at Locust Grove, from the Commonwealth of Virginia. At 26, George Rogers Clark was a confident frontiersman with a vision that would nearly double the size of his country in one stroke. A red-haired six-footer, Clark was a knowledgeable frontiersman, an outstanding field commander, and extremely confident of his abilities to move and persuade anyone to do what was necessary to succeed against formidable odds of time, money, and manpower. Kentucky was a rich wilderness before the American Revolution. The abundant game, meadows and virgin forests attracted both Native Americans from the North and frontiersmen from the East, such as George Rogers Clark. By 1776, a few isolated settlements had sprung up, as settlers refused to heed England’s proclamation of 1763 that forbade such westward settlement. When the Revolutionary War broke out, the settlers found themselves caught without protection from Indian raids that were backed and encouraged by the British army. Ever concerned about the safety of settlers, Clark persuaded Virginia to declare Kentucky a county of Virginia, which entitled it to an identity, a government and supplies. Clark then convinced Virginia’s governor, Patrick Henry, to send him with a small army to the areas north of the Ohio River to capture British outposts there, thus reducing the Indian threat for Kentuckians. After the war, George Rogers Clark settled in the rapidly growing town he had founded, Louisville. He built a cabin on land in Indiana given to him and his men by the government, he participated in Louisville’s civic affairs and helped resolve problems of land grants for his former troops. He also served on Indian commissions because of his expert ability to negotiate with the Native Americans. Later in his life, ill health resulting from the dreadful exposures during his long march to Vincennes began to limit his activities. Clark went to live at Locust Grove with his sister Lucy Croghan and her family in 1809 after undergoing an amputation of his leg as a result of a serious burn. Clark continued to receive visits and give advice towards the community at large while under the care of his sister’s family. He stayed at Locust Grove until his death on February 13, 1818. He was buried in the family plot behind the house and later reinterred at Cave Hill Cemetery in Louisville. Clark’s contributions to Kentucky and to the nation are numerous. As a military commander he was unmatched. Locust Grove stands today as a memorial to George Rogers Clark.